I guess the real question is: will blood sheen? OH, wow, it's beautiful. The old Spoors pens are selling for about $50 (not the really pretty ones, but the usable ones). I'm really excited to see yours in action. I will post samples when I get it. They were less expensive during the Kickstarter campaign, but I see that they have gone up. I just looked up some Spoor pens - thanks for mentioning them! Okay, here goes. 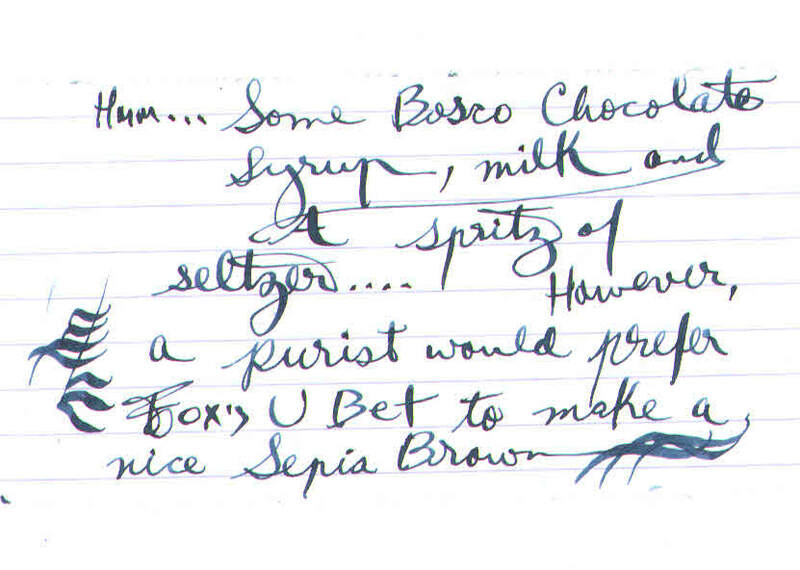 A couple of words written in human blood (mine), using a Blanzy Plume Princess No.730 EF dip pen on Rhodia paper. The other samples are for contrast using the same nib but with different inks. To note - the Diamine Red Dragon is quite dark here, which may be a function of the pointed pen as it is a bit lighter from a Pilot 78G fine (not shown). The blood shows a lot of orangeness to it - picture on screen is near identical to what it looks like in person to me - and there is shading but not obvious sheen. If time permits I may try this again with a broad italic nib. Blood was also very well behaved off the nib, cleaned easily and dried very quickly under a desk lamp. Apologies for the poor handwriting - it was rather dashed off. WD-40 in a Lamy converter, because it was completely bubbly and stiff. Works like a charm. Did you write with it or just use it as lubricant? WD-40 will slowly dry up your rubber seals and can damage some plastics, be careful. 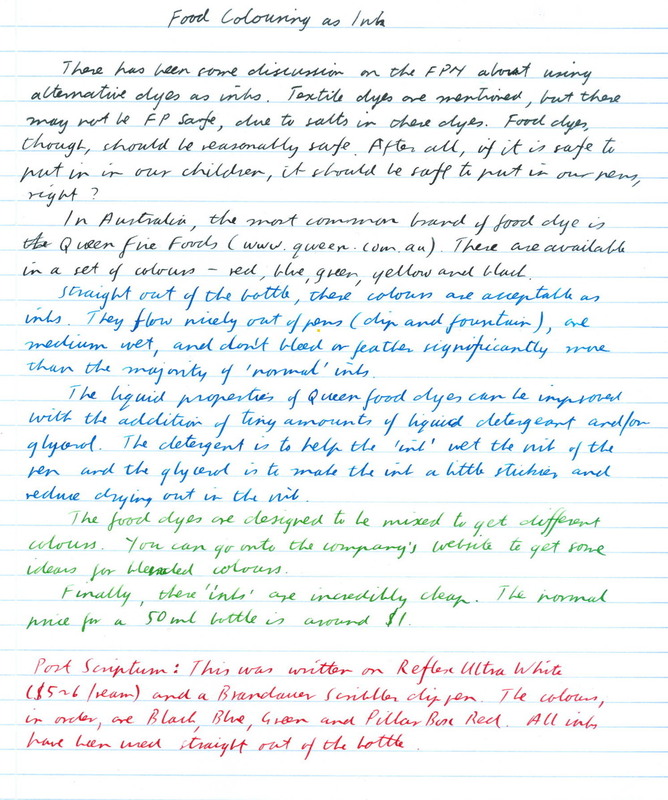 Hmm, it appears I only used dip pens for this sample. Do the De Atramentis Wine inks count? They are made of wines. 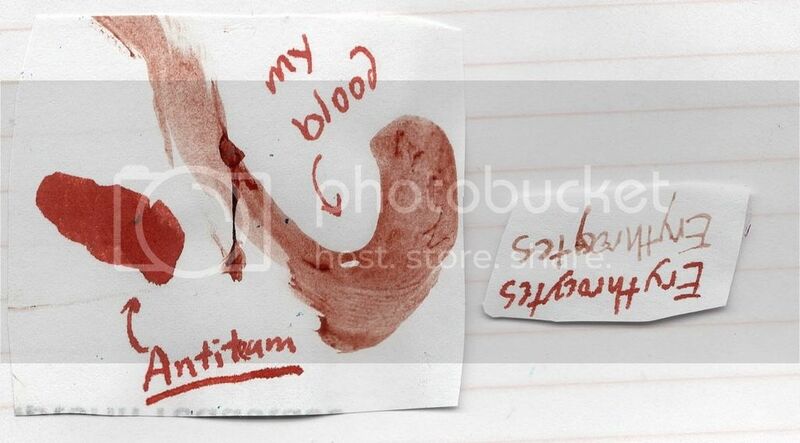 Nop, a thin layer of dried blood isn't really a different color than dried caked on blood, so it wont sheen. Flex nib? There's a lot of nice line variation. Edited by PandaPen, 25 April 2016 - 18:47. Nice,but why is the chocolate/milk/seltzer so dark and blue? 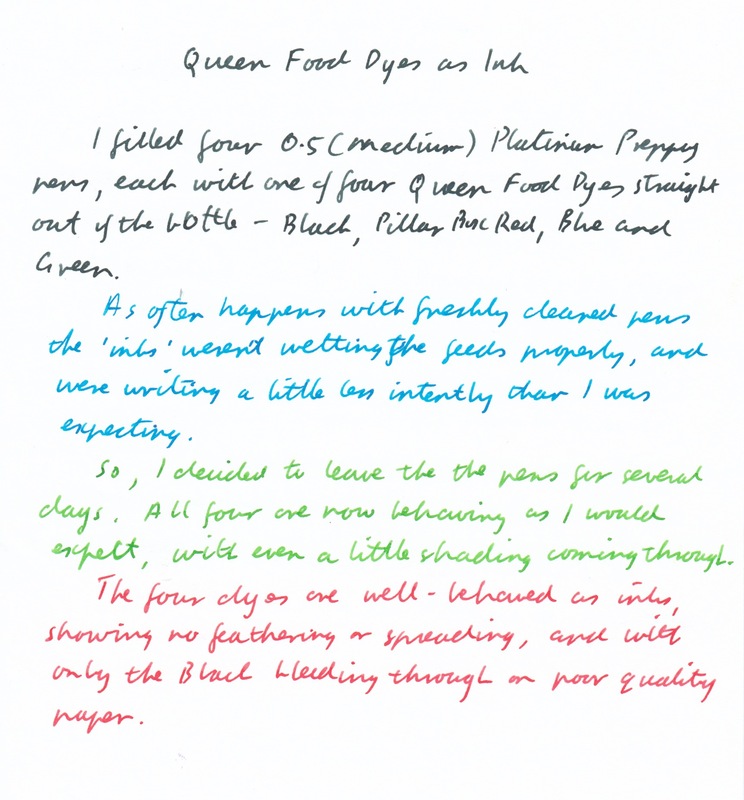 I cleaned out four Platinum Preppy pens, and filled them with the Queen Food Dyes, as inks. No adjustments were made, no dilution, no flow agent, nothing. What was in the bottle is what you get. Paper is Tomoe River. I'm quite impressed. I confess to having used the kids Easter Egg dye tablets to try out some water coloring. The kids have recovered. Green gouache in a MB 144. I have a spare feed. Fairly dilute. I was told back in the day as an art student that gouache is dye based. The MB is the only pen I have a spare feed for. Some time ago, upon receiving Antietam, which was probably intended to resemble blood, I decided to bleed myself a bit and write with some blood. I didn't use anticoagulant, and thus the blood stuck to the feed and was quite a hassle to clean off. (as you can see in the swab, it was already clotting when I put it on paper.) For the love of whatever you believe in, don't fill your pen with half-coagulated blood! Low saturation, but very well behaved (If such a clumpy, obstinate liquid can described as "well behaved") - no bleed through observed. No sheen, though - when thicker parts dry, they dry into clumps and flake off. Again, it's more orange than you would imagine, when fresh. Also, it isn't quite saturated. (at least mine isn't) EoC must have very thick blood! Edited by bioluminescentsquid, 15 May 2016 - 00:17. Ah, but I used a dip pen so no feed required - other than the "feed" hahahacoughdraculacoughhahaha! I dropped the blood straight from the wound onto the nib and wrote immediately. Reminds me, I need a tetanus shot booster. Didn't I hear some where that people used milk for secret communications? Been there, done that. Write with milk, it dries invisible. Warm gently and it turns brown and readable. Same as lemon juice. I'll admit that I add a few drops of my own blood when I refill my 580Al with Noodler's Fox. I use that pen strictly for Rune workings so the blood is necessary according to my beliefs. 4 drops to a barrel and I've noticed no ill effects thus far. Edited by meiers, 03 August 2016 - 12:33. So I have some special crayola paint for pens that I am going to try. Tell us more. I have some Dollar pens which have quite a broad ink channel in the feed that might suit.